I just discovered this line exclusive to Sephora, and I cannot believe these eye shadows. They are extremely saturated, more so than Urban Decay, which I used to think were the best. 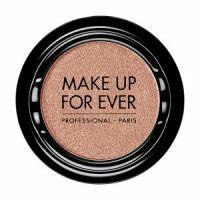 These have a good price point, and the makeup artist at Sephora showed me how to use 3 beautiful shadows to create a dramatic eye. Highly recommend. I have the bright fuchsia and I love the pigmentation of this. It does last all day. The biggest beef I have with this that even after wearing a primer, it happens to stain my eyelids for a few hours after thoroughly removing my makeup. Also, it's EXTREMELY expensive at $19 a pop. You do get a bit of shadow and I like how the case has a magnet on it so the lid isn't going to pop off accidentally. Good eyeshadow. I don't usually use this brand, but I got it as a gift. I got a set of 2. i'm not sure how much they cost, so I'm not able to factor any of that in to the review. The color had rich pigmentation, and it lasted all day (which is rare for me). I didn't have to deal with creasing either. I did have to use a drop of oil to help dissolve it when I washed my face at the end of the day, but the fact that it stayed on all day is great.